NetCom+ Family is based on modern high performance RISC processor. January 13, 2015 - VS Vision Systems GmbH - Industrial PC provider - presents the NetCom Plus, Serial Device Servers. This is a new family from the NetCom series. The use the proven protocols, drivers and tools of the NetCom and NetCom PRO/WLAN families, so installed drivers immediately detect them. Cooperation with devices from other families is ensured. The functions of encryption via a VPN have been notably enhanced, so the use for remote service can be matched in a flexible to way to a diversity of network configurations. For example one central server for openVPN can be used for several NetCom Plus simultaneously. The models with WLAN function may additionally operate as an Access Point. In this way they take care of Windows 7 and later versions, where the classic Ad-hoc mode has been removed from the operating system. 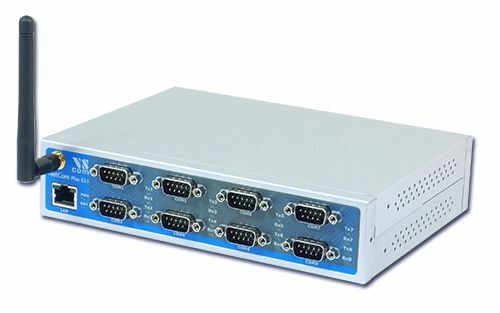 The NetCom Plus 411 and related models operate in the same way as the NetCom Plus 811, with four serial ports instead of 8 connectors.